Quantitative polarizing light microscope for research applications. Advanced Polarized Light Microscopy Under Both Diascopic And Episcopic Illumination. Nikon’s Eclipse polarizing microscopes are renowned for their ability to produce brighter, clearer, and higher contrast images. 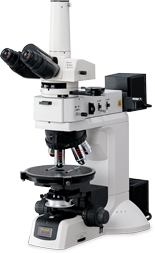 The LV100 POL, available in diascopic and episcopic microscope illumination types, continues this tradition and offers a completely reengineered base for even easier operation. It also features an exclusive high-intensity halogen light source, which delivers brighter images, lower power consumption and less heat generation, thereby reducing the chance of heat-induced focus drift. The high intensity 50W halogen light source incorporates a fly-eye lens design that outputs more light than a 100W lamp. The greater brightness is achieved by optimizing the lamp filament size and optically expanding the size of the light source within the pupil illumination fulfillment. The LV100’s CFI LU Plan Fluor EPI P objective series uses eco-glass that is manufactured to the same specifications as Nikon’s proprietary infinity optics (CFI60) system, but without harmful substances such as lead and arsenic. The focus stroke has been improved to 30mm, facilitating observation of tall samples. The reversed-type quadruple nosepiece provides more space at the front of the stage to make handling of specimen slides fast and easy. Another advantage ofCFI60 objectives is that their increased objective lengths and longer working distances provide more working space around the nosepiece to exchange specimens or oil the slide. The high precision slider-type analyzer located in the intermediate tube is rotatable for a full 360°. Focus drift resulting from light source heat is greatly reduced by virtue of the lower power consumption and heat generated from the new diascopic light source. Both Diascopic (transmitted) and Episcopic (reflected) polarization observations are possible by mounting the LV-UEPI universal epi-illuminator. By mounting the LV-UEPI universal epi-illuminator and optional universal-type nosepiece and DIC accessories including objectives, Episcopic DIC microscopy is possible. The stage is large-sized, pre-adjusted and click-stops in 45° increments, making it extremely accurate and easy to rotate. Because the stage is designed to be supported from the bottom of the microscope near the optical axis and incorporates steel cross roller guides, it is twice as stable and durable as conventional stages.